Here you can find a wide variety of antique surgical instruments, bone saws, old leather doctors bags, ear trumpets, human skeletons, cobalt blue apothecary pharmacy bottles, contraceptive pessary stems, and antique quack medical contraptions of all kinds. 1910 MILKS EMULSION Remedy TERRE HAUTE INDIANA Consumption Asthma CURED Testify! Antique Metal "Medical Instrument Case"
Rare Tag USA pencil thermometer /holder Works Great!! Vintage Reiter Electrostimulator Early 1940's? 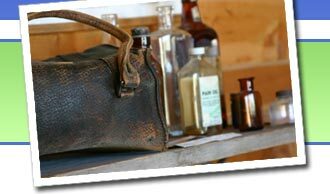 Vintage Antique Large Leather Doctor's Medical Bag Lined 16" x 8"x 10"